CANADIAN PRIME MINISTER Justin Trudeau is facing the biggest political scandal of his administration. The scandal centres around claims that Trudeau’s former attorney general, Jody Wilson-Raybould, was inappropriately pressured by the Prime Minister to prevent the prosecution of a major Canadian engineering firm accused of fraud and bribery. The affair has been politically costly to date. Gerald Butts, Trudeau’s closest adviser and a longtime friend, resigned two weeks ago, according to The Guardian. Wilson-Raybould has also resigned. So, with that, here’s how we got to this point. Montreal-based SNC-Lavalin is accused of bribing Libyan officials to win construction contracts, according to The Global and Mail newspaper. The company was charged in 2015 with corruption for allegedly bribing officials in Libya between 2001 and 2011 to secure government contracts during former strongman Moamer Kadhafi’s reign. SNC-Lavalin has heavily lobbied the Canadian government, including senior officials in Trudeau’s office, for an out-of-court settlement that would include paying a fine and agreeing to put in place compliance measures. Here’s where the scandal comes in. Wilson-Raybould testified this week at the House of Commons Justice Committee that Trudeau, one of his ministers and close advisors applied “inappropriate” pressure on her, including “veiled threats” to intervene in a criminal prosecution. She said that from September to December 2018 officials “hounded” her to ask prosecutors to settle the case out of court. Wilson-Raybould has refused the requests, and the trial is set to proceed. The allegations were first reported by The Globe and Mail, citing unnamed sources, and were confirmed Wednesday by Wilson-Raybould herself while testifying at the justice committee. Why help the company out? The construction and engineering company is one of the world’s largest. During its lobbying, the company has argued that those responsible for alleged wrongdoing left the company long ago, and that holding it accountable for their criminal actions would severely hurt its business. A guilty verdict would notably result in a 10-year ban on bidding on Canadian government contracts. There were suggestions in the press that it might also move its headquarters to London if that happened. What is the government’s position? Trudeau has said he “completely disagrees” with his former attorney general’s characterisation of events. He has insisted he and his team were rightly looking to safeguard up to 9,000 Canadian jobs, including in his own Quebec electoral district. Wilson-Raybould has referred to this as improper “partisan political considerations”. Trudeau has insisted that he made clear to his former attorney general that the “decision around SNC-Lavalin was Wilson-Raybould’s and hers alone to make”. In Canada, the attorney general and justice minister are conjoined positions, something critics say blurs their separate responsibilities – the former is the country’s top prosecutor and independent from the political, partisan role of a cabinet minister. Wilson-Raybould has suggested they should be split. What are the political consequences for Trudeau? 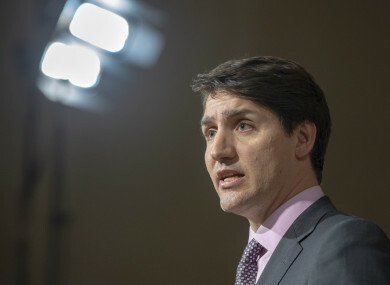 The major political controversy unravelled when The Globe and Mail first reported on 7 February that Trudeau’s office attempted to pressure Wilson-Raybould to intervene in the case – months from the next election. Wilson-Raybould, Canada’s first indigenous attorney general, was shuffled to veterans affairs in January, and, as noted above, a month later resigned from cabinet. Days later, Gerry Butts, Trudeau’s closest adviser and a longtime friend, also quit. “I think if the Liberals had not replaced Ms Wilson-Raybould in January as attorney general, we might never have heard about any of this,” said Daniel Beland, a politics professor at McGill University in Montreal. The accusations weigh heavily on Trudeau because he has repeatedly affirmed the independence of Canada’s judiciary. His stance was notable in the case of Meng Wanzhou, a senior executive of Chinese telecommunications firm Huawei who was arrested in Vancouver on a US warrant and faces possible extradition. Opposition Conservatives have took opportunity of the controversy to call on Trudeau to resign and for a federal police investigation into the matter. The leader of the opposition, Andrew Scheer has said Trudeau “simply cannot continue to govern this great nation now that Canadians know what he has done”. The Guardian has reported that a number of politicians have requested to testify before the justice committee. These include Butts and Michael Wernick, the country’s top public servant. It also reported that Trudeau said he would consider the future of Wilson-Raybould in the Liberal Party. A poll taken since the scandal erupted put the opposition Conservatives in the lead ahead of the ruling Liberals, for the first time since Trudeau came to power in 2015. So, while the final outcome of the scandal remains unclear, it’s apparent that it’s having serious political consequences. Email “Explainer: Canadian PM Justin Trudeau is facing a political scandal ... what's it all about? ”. Feedback on “Explainer: Canadian PM Justin Trudeau is facing a political scandal ... what's it all about? ”.